Hear New Music From Phoebe Bridgers, Julien Baker, Lucy Dacus' Supergroup Boygenius The three songwriters share a musical sensibility and a friendship, so it's only natural they combined their superpowers for a collection of aching, intimate songs. 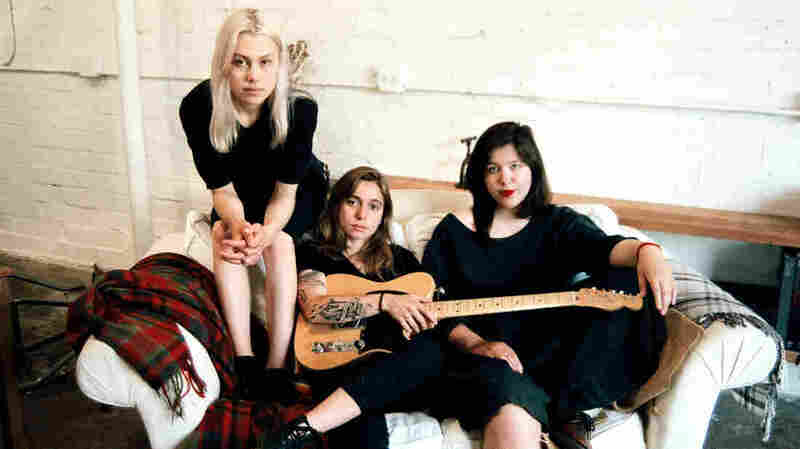 Phoebe Bridgers, Julien Baker and Lucy Dacus are boygenius. Julien Baker, Lucy Dacus and Phoebe Bridgers share a musical language: thoughtful, often sparse rock arrangements that bolster deeply self-aware, intimate lyrics. There's a sense of wisdom and compassion in the stories they tell, often undercut by a dark humor — like the kind of friend you'd dream of having to help nurse you through a heartbreak or help you find the fun in a stagnant situation. Of course, I'm just guessing about what Dacus, Baker and Bridgers might be like as friends. It might be better to ask these women themselves since, as it turns out, the three share not only a musical sensibility but an emotional closeness as well. "When we met, Lucy and Phoebe and I were in similar places in our lives and our musical endeavors, but also had similar attitudes toward music that engendered an immediate affinity," Baker explains in a press release. "Lucy and Phoebe are incredibly gifted performers, and I am a fan of their art outside of being their friends, but they are also both very wise, discerning and kind people whom I look up to in character as much as in talent." Now, the three songwriters are releasing a self-titled EP as boygenius. Baker had dreamt of starting a band with Dacus and Bridgers for some time, but the trio decided to write music after booking a tour together under their solo acts. The partnership worked so well that they ended up with enough music for a full EP. Each artist brought a finished song and an unfinished idea to the boygenius session, finalizing the six-song collection collaboratively. The three songs released today show how the project highlights each artist's individual voice and the spirit of cooperation inherent in the endeavor. "Me And My Dog" is the kind of mid-tempo broken-hearted love song at which Bridgers excels, piecing together intimate moments of internal monologue and direct address. "I want to be emaciated / I want to hear one song without thinking of you," she sighs, "I wish I was on a spaceship / just me and my dog and an impossible view." "Stay Down," meanwhile, burns with the aching intensity of Baker's best songs, rooted in her characteristic habit of staring down hardship with kindness in her heart. "Bite the Hand," which opens the EP, is perhaps the best reflection of the solidarity at the heart of boygenius. Dacus takes the lead, crooning, "I can't love you / how you want me to," as the song slowly builds, then deconstructs — by its end, all three women sing the line in a round, then close the song by singing it in three-part harmony. Hearing the three voices together feels like an auditory metaphor, both for these artists' penchant for writing lyrics listeners can see themselves in and for the network of mutual support that brought the group together in the first place. The self-titled EP from boygenius comes out Nov. 9 on Matador Records.